Mytilene, November. On the island, the feeling of being between East and West prevails. On the streets of the town, in the architecture and music, senses and rhythms dominate everywhere. The place is the combination of two cultures, often reminding the charm of the East. Here is the starting point of Europe and its maritime borders. When an immigrant gets here, he is now in Europe. Frontex has established an authorized team. Although the border of the sea is not a fence, such as the one in Evros, it is dangerous and often impenetrable, while the conditions under which the journey is conducted, surrender the travelers to the vastness of the sea. The action-meeting “The good will come from the sea” invited immigrants and locals to get together for a few hours, like a wish: through this we expressed the desire to reverse the current situation in the Aegean Sea and in other Mediterranean seas, in islands such as Mytilene and Lampedusa. The Aegean is stained with blood, as it is one of the major entrances to the Europe-fortress. In this state of exception, the bodies in the Aegean Sea lose their importance, human lives do not count, they are “naked lives”. It is not easy to cross the sea, they drown in a one-hour route which for others is a daily routine as they just go to Turkey for shopping and return in the evening. Europe does not care about immigrants -they are garbage. It looks for ways to abandon them here at the beginning of their journey, at the Aegean waters. And the Greek government follows the orders. What do the locals do? Many are concerned about the situation, they take action under difficult conditions. Along with the immigrants who had rebelled and with the help of international activist networks, they shut down the old detention center at Pagani and created the “Horio oloi mazi” (village all together) (2009), a village of solidarity and hospitality, an example of a self-organized reception area. There are also other important initiatives through networks such as the “Journey Back to Lesvos”(1). Many help anonymously, others do not want to know anything, others consider it is only a local problem and do not want to discuss it. Day by day, however, more and more are those who understand that the issue is not just about Greece and Europe, but global. The Tsamakia beach, where I was hosted by the Caravan Project, is close to the port. Immigrants came here for a little walk. What immigrants? Those who had left the “first reception center”: that is how they name it, but in fact it is more like a military camp, located in Moria. Others had stayed there for 40 days, others for a month, and others for a week. Then they bring them here in the port, with a temporary document in order to leave for Athens. “It is a prison, we were like animals, living amid dirt, cramped together, there were no doctors, care, nothing, nothing,” they said. We met them there, at the edge of the port. A young woman with her baby, 18 months (she had given birth during the journey from Afghanistan), was sleeping on a blanket on the cement floor• the others were young. They had no money to leave, so they were forced to remain in the port. It was raining for the next two days. They came to find us, they were soaking wet. We drank hot tea. Moving on, we saw immigrants waiting in line, in a place that we could not get closer. We were told that they were taken straight to Moria. They were the ones who had just arrived by boats from the other side. Another day a couple came in the yurt, an African with a Greek woman and their baby. They came to live in Mytilene. It is the exception, usually immigrants want to go to Athens and then to Germany or Sweden. The area of PIKPA in Neapoli was deserted, but now it operates as an open reception center of the “Horio oloi mazi.” There the immigrants live free in a familiar place. It is situated among trees, smells food and is taken care of by volunteers from Mytilene. The mayor recently decided to shut it down, but it continues to operate. The next day we went to see the “center” of Moria, which is intended for long-term detention of more than 600 people. Moria is the nearest village, but the “center” is located at a distance, isolated. It is the extension of an old military camp, within a large area. A sophisticated prison, with double and triple fencing, barbed wire everywhere, and among olive groves. We moved inside because they had forgotten the door open. We saw another internal fencing and wretched people, defenseless, who were eating food off the floor, women, children, young, men. Standing Stooped, greeting secretly and were afraid. Their body betrays their mental state. The policeman drove us away quickly. In the village, in Moria, they told us that they did not want this to occur, they weren’t even asked, “it is a prison, we do not need it”. A non-place, a nowhere, where confinement and fear dominates: this is the hospitality of Europe for people who need a new land. “Those who are washed up by the sea, are collected and buried. Because they do not know who they are, their only put a number, they are buried without a name. Once we picked up a corpse, so we thought … but then slowly he recovered, when he came out of the water. It’s so frustrating that they drown in such a close distance. Often, they drown when the port officers find them in the boats and turn them back, and they leave them in the sea, just before Turkey”. (Testimony from immigrant who lives in Lesvos). 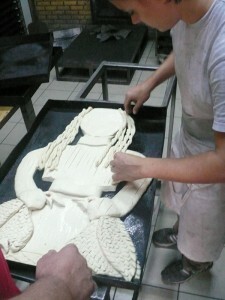 We thought to make a bread sculpture in the meeting, inspired by the goddess Artemis and to offer it to the guests. It rained heavily the day of the action-meeting. At 2 pm the driver of the municipal minibus called to tell us that he would not come, that “does not want to transfer illegal immigrants” .. What would we do in such short notice? The transfer eventually was achieved by friends and with a small minibus which was rented. Soon, although it was raining heavily, everyone was in the yurt. Women, children, men, young boys. All together here. The floor was covered with different types of carpets. There was hot tea and the bread-sculpture in the center of the area. The bread was made by Mathaios, from the wood-fired oven (Fournos me ta xila), an artist and baker as well. He was once an immigrant in America. He offered the bread and did not take any money for it. The stories were difficult to be heard because it was raining heavily. The voices were lost, were whispers in the sound of the rain, whispers about journeys, for inclusions, for losses, for separations, but also about dreams. Solonas sang the song of the exile, “ta erima ta ksena” (isolation and exile): “And what will become of me now my dear, in a foreign country and I suspire, I cry out for my mommy.” the Greeks were once immigrants, and once again now. In the end, they were offered food that was prepared by the Palestinian friend who lives on the island. We danced all together, we wanted to take our minds of the situation through dance. There was a power cut due to rain, we continued the stories till late at night. The next day it did not rain, the sea was calm and the stray dogs were lying around the yurt. We thank Efi Latsoudis from “Horio oloi mazi,” the Bakery “Fournos me ta xila”, Solon, and those who helped to implement this action-meeting.